Vegetable stock just before putting the lid on the pot. I’m on day two of the pre-cleanse and I’ve had some adventures in cooking. Since I can’t eat processed foods, some items that I’d use out of a can can’t be used. 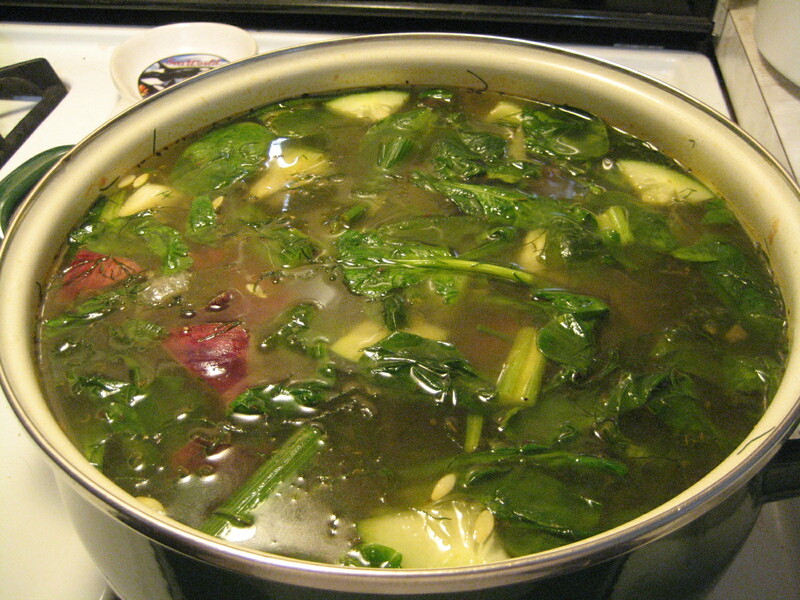 One of those items being, vegetable stock. But I’ve learned that making your own stock isn’t that hard. Since I went to the produce market yesterday, I have a LOT of fresh vegetables along with some vegetables I bought a week ago that I still haven’t gotten around to eating. Since money is tight, I don’t want to throw anything away. I looked up how to make it and found this recipe from VeganYumYum.com. I’ve read her site before and she has amazing recipes and photos. She really makes everything look super easy. I pulled the baby spinach, celery, old carrots, sliced cucumber, and fennel (aka anise) out of the fridge and started chopping. I really like to eat raw fennel, but just the bulb. It looks like you’re peeling layers off an onion, but fennel has a light, fresh, licorice taste. I just have no idea what to do with the stalk part of it. Making the broth eliminated that waste. My whole apartment smelled of Thanksgiving dinner by the time the broth was complete. I strained it into a pitcher as she suggests, and then filled two ice cube trays for future broth needs. I also have a pitcher of the broth for use over the next two weeks while doing this cleanse. 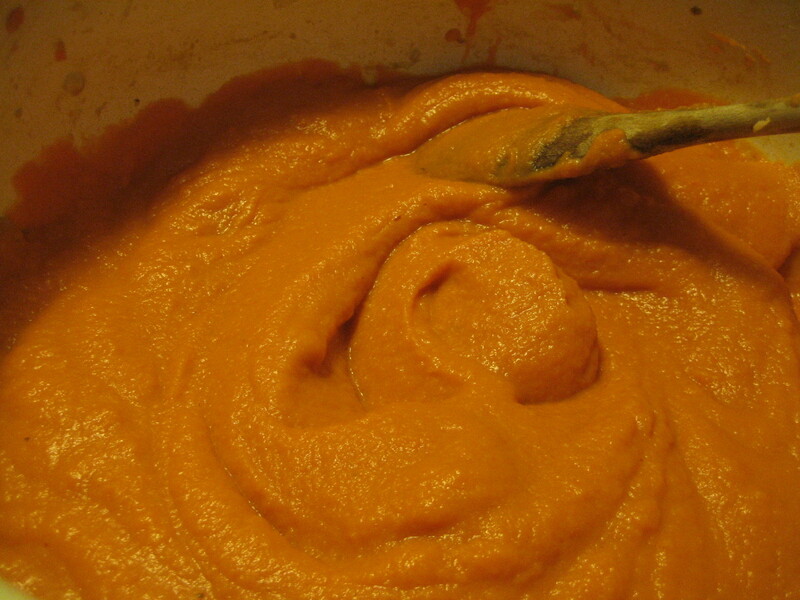 Then I began the main recipe of my day, Vegan Carrot Ginger Soup. I found a great deal on a 10lb bag of carrots. Once I saw the bag in my fridge, I was really worried about being able to eat all of them. I skipped the maple syrup listed in the recipe since I only have Mrs Buttersworth and that is a processed food and not really maple syrup anyway. I was hoping to really liquify the soup in my food processor, but I can’t get it to work. I’m very heartbroken by this because I’ve only been successful in getting it to work once. If anyone wants a food processor you can take this one, if you can get it to work, you were meant to be its owner. Since the food processor wasn’t cooperating I scooped bits of the soup into the blender. It came out wonderfully but it was quite a process. The whole cooking session from vegetable broth to final soup only took about 4 hours. Not a bad use of my day and all my skills. This entry was posted in Cleanse, Food. Bookmark the permalink.